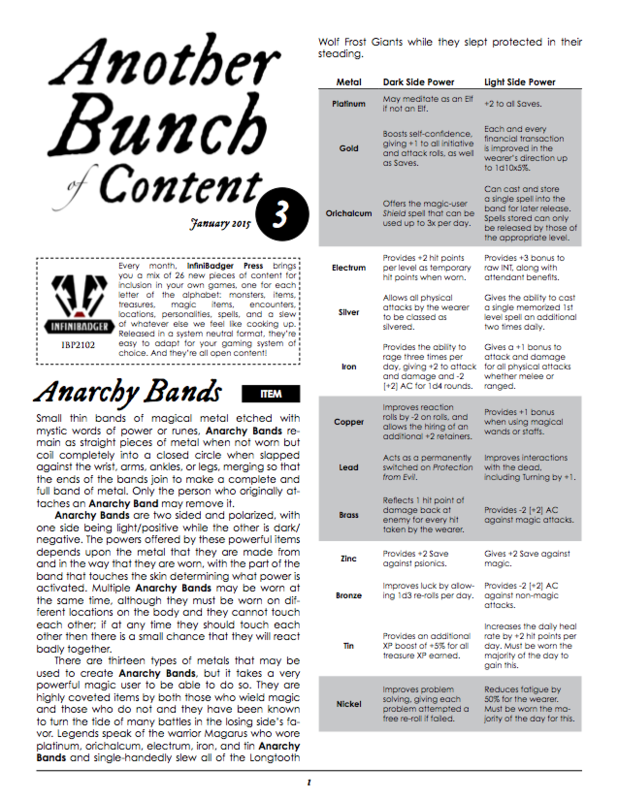 Another Bunch of Content is our monthly newsletter that gives 26 new pieces of system-neutral content for you to use in your games. Released in an OGL-friendly format, there’s content in here spanning monsters, items, locations, personalities and everything else you need to add new flavor to your games and settings. Not only is this great gaming resource available in single monthly issues or 6-issues subscriptions, but every 6 issues will be collected into a compendium and be revised and reformatted and made available both digitally and in POD format. Additionally, there is also a complementary and free Issue Index that is continually updated as new issues are released, listing entires and the issues they are found in not only in alphabetical order, but also by categorical order. Available via DriveThruRPG and RPGNow. FREE. Contents: Aagat, Blades of Unerring Focus, Chessmen Idols, Draw Water, Elsona’s Stand, Farseeing Eyes, Gem Eaters, Horx, Indigo Starrunner, Jaloon, Kaffa, Little Love, Moograks, Nine Needles, Ogre Pants, Pyronauts, Qa, Rattus Cyprius, Soulgazers, Tenebrax, Uluos, Vineguard, Waste Muscles, Xõlti, Yar Tanaske, Zami Fruit. Contents: Ancestral Insight, Bragenti Brotherhood, Carvers, Dragonplague, Elok of the Arches, Firewerms, Graulites, Honor Marks, Impede, Jouker, Karbak’s Book of Faces, Lannart’s Wort, Marsh Zombie, Neyt, Obrakka, Pits of Galathaen, Queensfever, Rysak Amarish, Sweetleaf, Terran World Engine, Unknow, Varash, Worldwound, Xerisi, Yarrow Salve, Zymotic Warrior.